Visiting diverse Middle Eastern restaurants across the Greater Toronto Area, one quickly discovers that they all feature tabbouleh on the menu. As an Egyptian, I had never eaten tabbouleh until I started my undergraduate degree at York University in Toronto. It is not part of the Egyptian tradition. Interestingly, while Syrian and Lebanese emigrants found their way to Egypt in large numbers throughout the mid- to late-nineteenth century, this side-dish never made its way into mainstream Egyptian cuisine, and especially, the average family kitchen. However, in North America it has come to be defined as “authentically” Middle Eastern. The first time I tried tabbouleh, I was with a group of friends from various ethno-cultural backgrounds. When I asked what kind of salad that “green dish” was, I was met with confused expressions. The person across the table asked me: “I thought you were Egyptian?” Somehow, not knowing what tabbouleh was made my very claim to “Egyptian-ness” questionable. This simple appetizer had come to define what it meant to be Middle Eastern in the western imagination. Meanwhile, Egyptian kushari will never be found in a restaurant in the GTA. Eaten since at least the nineteenth-century, this famous staple of Egyptian cuisine will only be found in family kitchens and mosque and church festivals. This dish, central to my own memories of ‘home’, remains confined to the familial private sphere and community cultural festivals. 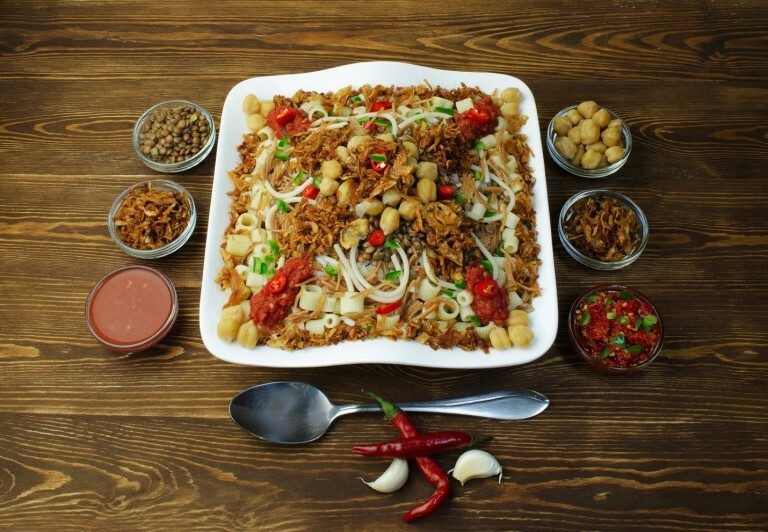 Kushari is made of rice, macaroni, and lentils mixed together, topped with tomato-vinegar sauce, garnished with chickpeas and crispy fried onions and sprinkled with garlic juice and hot sauce. Wikimedia Commons. Why is something as seemingly simple as food so influential to the average Canadian’s conception of the Middle East and its culture? Food carries messages about class, gender, ethnicity, religion, and identity. Food is not only what is materially before us or the raw ingredients which go into making a particular dish: it has symbolic significance. For food historians, two terms encapsulate the relationship between food and culture. First, “foodways” represent the connection between ethnicity and food. Foodways can often be a point of social contact and outreach, a way of expressing identity, and a tangible way to remember ‘home’. Second, “foodscapes” represent the culinary cultures of a place. If foodways are the material and cultural significance of food to a group’s identity, then foodscapes are the physical manifestations of culture across space in the proliferation of ethnic restaurants, markets, grocers, food festivals and street-corner vendors.1 How, then, have Syro-Lebanese foodways come to dominate public (commercial) foodscapes in Toronto and successfully push out other Middle Eastern immigrant groups’ distinctive ethnic cuisines? Traditionally, the ‘Arab world’ comprises 22 countries and territories which speak Arabic. These territories occupy an area stretching from the Atlantic Ocean in the west to the Arabian Sea in the east, and from the Mediterranean Sea in the north to the Horn of Africa and the Indian Ocean in the southeast. From 1863 to 1915, Syrian and Lebanese Catholics emigrated in large numbers to escape overpopulation, economic stagnation, and the military draft. Approximately 100,000 emigrated from Greater Syria. Until 1878, the flow went predominantly to Egypt. Thereafter, and particularly after 1899, Syro-Lebanese migrants largely went to North America and Australia. Between the First and Second World Wars, border restrictions across North America tightened through the enactment of racist and nativist policies. For many Arab immigrants, the dream of returning to Greater Syria faded. Family reunification in Canada replaced dreams of returning, as immigrants chose to sponsor their families and began to establish a life for themselves. Initially, social patterns and mutual aid developed around familial networks in tight-knit, yet spatially scattered, communities. The family’s patriarchal structure extended out into how the community worked together to regulate female honor and support the productive capacities of the family economy. Peddler mobility meant greater cultural integration as migrants had sustained contact with western society and adapted quickly to language and fashion codes. As more and more sought out entrepreneurship and family reunification, the rising population meant greater cohesion and visible markers of identity, such as churches and mosques, markets, street vendors, dry cleaners, and general stores. Rather than one unified Arab-immigrant community, there are many religiously and geographically exclusive groups. Particularly after the 1960s, Middle Eastern immigration has been marked by a high level of diversity. Egyptians became the largest immigrant population, followed by Tunisians, Moroccans, Algerians, Iraqis, Libyans, and Palestinians. Yet, the timing of Syro-Lebanese immigration has left its mark on Canadians’–and in fact, most North Americans’–conception of Middle Eastern cuisine. Specifically, Syro-Lebanese entrepreneurs and restaurateurs mobilized images and standards of what an “authentic” Middle Easterners’ food should look like. Often, these standards set expectations for non-Arab consumers and resulted in the coercion of future diverse proprietors to adopt Lebanese dishes on their menus or else risk being “inauthentic”. By inauthentic, I mean not truly Middle Eastern. Now, the typical Middle Eastern dish in the GTA is, in most instances, a particularly Levantine dish. Most often, non-Arab Canadians encounter Middle Eastern cuisine in the commercial public sphere. The earliest shops were established in the interwar period, to serve the Christian community from Greater Syria. Various markets, small restaurants, and Lebanese-dominated pastry shops, served as points of cultural contact with the city’s many Greeks, Italians, Yugoslavs, Albanians, Indians, Jews, and Armenians. Often, the basic ingredients served these multiple traditions and were highly sought after. Yet, over time Toronto’s ethnic groups began to hold certain expectations of what a “Middle Eastern” market or restaurant should sell.5 These expectations continue to shape the prevailing understanding of the region’s foodways. What remains in the private familial sphere, exists outside the social imagination of western eyes and mouths. Syro-Lebanese restaurateurs developed and standardized the menu and partly reinforced western perceptions of Oriental sensuality. Let us return to the prevalence of tabbouleh. We can find this appetizer in Middle Eastern restaurants throughout the city, across national and ethnic traditions. The Mezzeh (appetizer) section of the menu allows us another example of Syro-Lebanese dominance in commercial foodways. Few restaurants in the GTA carry foule, considered the “national dish” of Egypt.6 It rarely finds its way onto the menus of ‘Middle Eastern’ restaurants. Where it is offered, it is an appetizer according to the Syro-Lebanese tradition and served with tabbouleh, diced tomatoes, and hummus garnish. The next time you find yourself in an “authentic” Middle Eastern restaurant. Ask yourself: is this cuisine authentically Middle Eastern? Or, is it authentically Levantine Arab-Canadian? 1. Edible Histories, Cultural Politics: Towards a Canadian Food History, edited by Franca Iacovetta, Valerie J. Korinek, and Marlene Epp, (Toronto: University of Toronto Press, 2012); Food For Our Grandmothers: Writings by Arab-American and Arab-Canadian Feminists, edited by Joanna Kadi (Boston: South End Press, 1994). 2. Baha Abu-Laban, An Olive Branch on the Family Tree: The Arabs in Canada, (Toronto: McClelland and Stewart, 1980); May Ahdab-Yehia, “The Lebanese Maronites: Patterns of Continuity and Change,” in Arabs in the New World: Studies on Arab-American Communities, edited by Sameer Y. Abraham and Nabeel Abraham (Detroit: Wayne State University Press, 1983), 147-62. 3. Fouad Assaad, “Egyptians,” in Encyclopedia of Canada’s Peoples, edited by Paul R. Magocsi (Toronto: University of Toronto Press, 1999), 453-62; Gregory Orfalea, The Arab Americans: A History (Massachusetts: Olive Branch Press, 2006). 4. Ninette Kelley and M. J. Trebilcock, The Making of the Mosaic: A History of Canadian Immigration Policy, (Toronto: Univ. of Toronto Press, 1998). 5. William G. Lockwood and Yvonne R. Lockwood, “Continuity and Adaptation in Arab American Foodways,” in Arab Detroit: From Margin to Mainstream, edited by Nabeel Abraham and Andrew Shryock (Detroit: Wayne State University Press, 2000), 515-550. 6. In 2014, Maha’s Fine Egyptian Cuisine restaurant opened on the Danforth. It is the first to offer Foule as a main dish in the Egyptian tradition. However, the foule bowl is over-laid with sunny-side up eggs and falafel and accompanied by seasoned bread and sauces, to exoticize, sensationalize, and enrich the presentation for Toronto’s non-Arab patrons. 7. Edward W. Said, Orientalism, 25th Anniversary edition (New York: Vintage, 2003).